Here we go again. This is the first student review of the school year. Please respond, but also remember these are written by sixth graders. Do you know what it’s like to love a book so much you cry when you’ve finished with it? Do you know what it’s like when a book is so good you finish it in a week? That is how it was and how I felt when I read The Fault in Our Stars. It’s beyond spectacular. Mrs. Stiles, I remembered one time you said you were interviewing a girl and she abandoned a book, and you asked her why. She said because it was boring. You asked her how far she had read and she said the first page. A girl said The Fault in Our Stars was boring. But, really if you dig down deep you’ll find the gold. In the book there is this girl named Hazel, she has cancer and she goes to this support group called the Literal Heart or Jesus. Anyway, she meets this guy and ends up spending a lot of time with him. I don’t want to tell you what happens, a lot though. Let’s see, she has this book she loves called the Imperial Affliction by Peter Van Huten. She feels as if the book was written about her. Well, if I tell you anymore I’ll spoil the story. I love this book and if it were not the library’s book I would keep it. This book makes me appreciate life. It touched my heart and put me to tears. I would recommend this book to anyone, except younger children, because the book cusses a lot. Also, if you haven’t already seen the movie, the book is better. The movie leaves out a lot of key information. 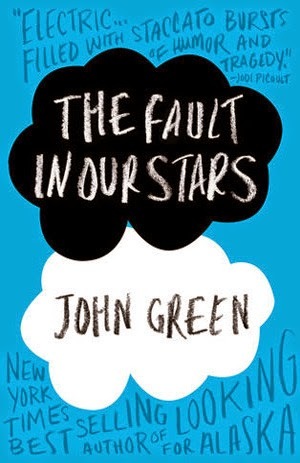 If I could rate The Fault in Our Stars I would give it five stars.